Spring Summer 2016 at Fashion Scout will be a season to remember, with a beautiful venue, fabulous FROW and most importantly- a whole host of incredible designers. All of our designers this season have wowed Fashion Scout’s guests. With both established talents like Apu Jan, and fresh, young designers from the Graduate Showcase. Highlights include James Kelly’s haunting collection which was simply beautiful, and Marko Mitanovski’s gothic escapism. This year’s Merit Award Winner, Katie Roberts Wood (Roberts|Wood) showcased her other worldly collection inspired by science and nature. Fashion Scout has seen a fantastic FROW this season with celebrities, influencers and international press all flocking to the Freemason’s Hall to see SS16’s designs. Pam Hogg’s celebrity following was in full force, with Lee Starkey and Jay Mahler taking to the front row alongside Ray Winstone's daughter, actor Jaime Winstone. MIMPIKITA and Judy Wu’s FROW were similarly peppered with celebrity guests including Bianca Miller and girlband Stooshe. A forecast of the next season’s trends Fashion Scout’s designers displayed bold graphic knits, intricate applique and fine, textured knits as key trends for SS16. A summary of this season's catwalk would be incomplete without mention of the incredible hair and makeup looks presented. At Fashion Scout The Body Shop and label.m for Tony&Guy created a breathtaking array of looks. It seems braids of all kinds will be a dominant trend for next season, as seen at Angel Chen, Niro Wang and several other shows. 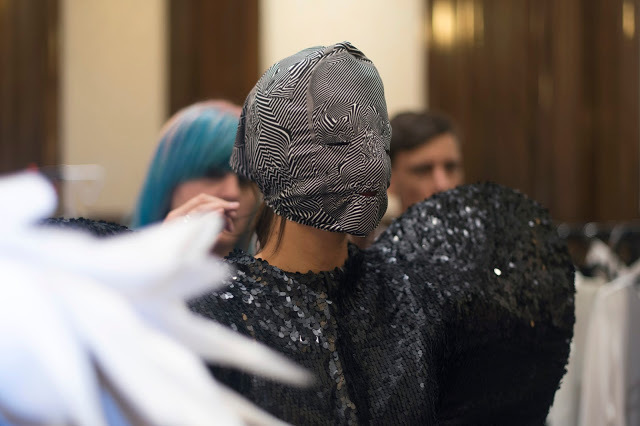 Fashion Scout SS16 took place on 18th-22nd September 2015 at The Freemason's Hall, Covent Garden. To relive the experience have a read of our show reviews throughout the blog, follow us on Twitter or take a look at our Instagram. We look forward to seeing you again in February for AW16. Days 4&5 - Coming Up!